:The autobiography of Dr. Michael Cassidy, one of the most influential people in the development of modern South Africa and a key figure in the growth of the Christian church in Southern Africa over the last fifty years. As the nations of Africa shook off the shackles of colonialism and embraced their newfound independence in the 1960s, a singular figure burst into prominence in the tumultuous and expectant atmosphere gripping the continent. A son of apartheid South Africa, Michael Cassidy appeared an unlikely candidate to bring a Gospel message of salvation, reconciliation and hope to a land throwing off the chains of white rule. 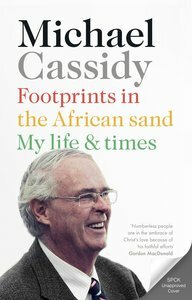 About "Footprints in the African Sand: My Life and Times"
Michael Cassidy is an evangelist, author and leader. He is tMichael Cassidy is an evangelist, author and leader. He is tMichael Cassidy is an evangelist, author and leader. He is the founder of African Enterprise, a ministry of evangelism, he founder of African Enterprise, a ministry of evangelism, he founder of African Enterprise, a ministry of evangelism, reconciliation, leadership training, and aid and developmentreconciliation, leadership training, and aid and developmentreconciliation, leadership training, and aid and development. He lives in South Africa.